Oh my goodness, what FUN we have had here in the Saini household lately! There are sooo many great fruits and vegetables in season right now, I can’t even contain my enthusiasm. Being a country mouse myself (I grew up in New Hartford, NY, a beloved little town near rolling hills and lots of farmland) I grew up picking strawberries with my mom in June and blueberries with my dear friend Meigan and her mom in August. Come Fall, we all went nuts for apples and freshly pressed cider (back in the day when it wasn’t pasteurized and tasted sooo good!). My mom had her own vegetable garden, full of tomatoes and green peppers. What happy memories they were. My mom passed away 8 years ago and it is now a bittersweet thing to do, but I was determined to pass this love of farm-picked fruits and vegetables to my little Kirina. There is something so pure and precious about teaching a child where their food comes from. I think it made Kirina enjoy the food more because she had a hand in picking it. 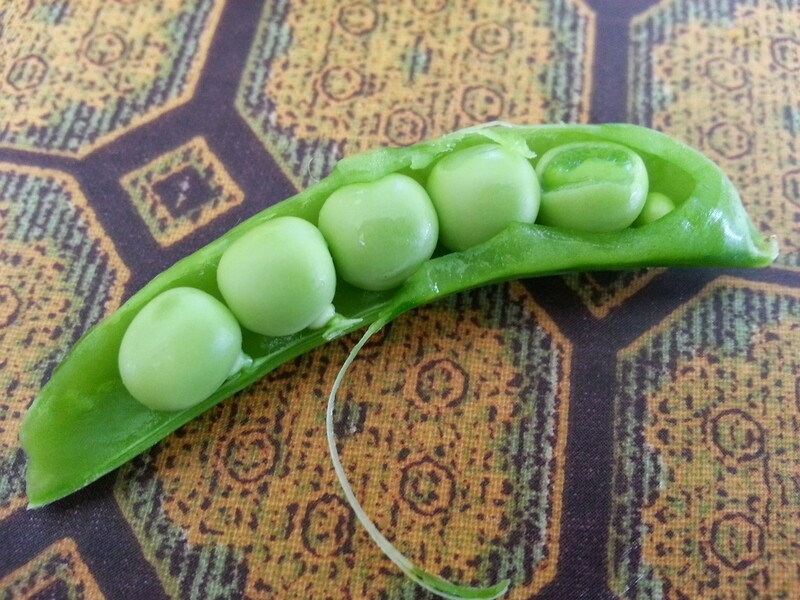 The peas, pictured above, were such fun to pick. 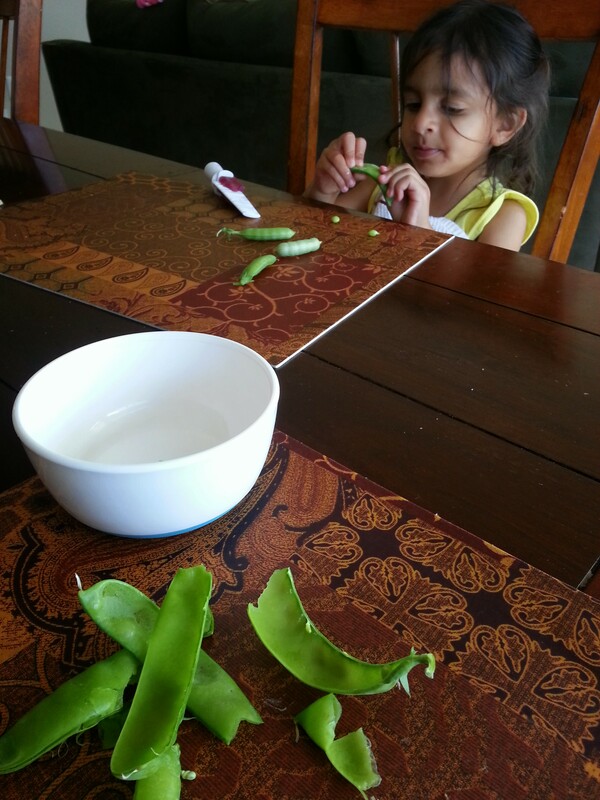 We’ve kept them in a bowl in the kitchen and Kirina grabs them now and then to munch, having fun peeling away the pods and searching for the sweet peas inside. It’s pretty fun to watch her. 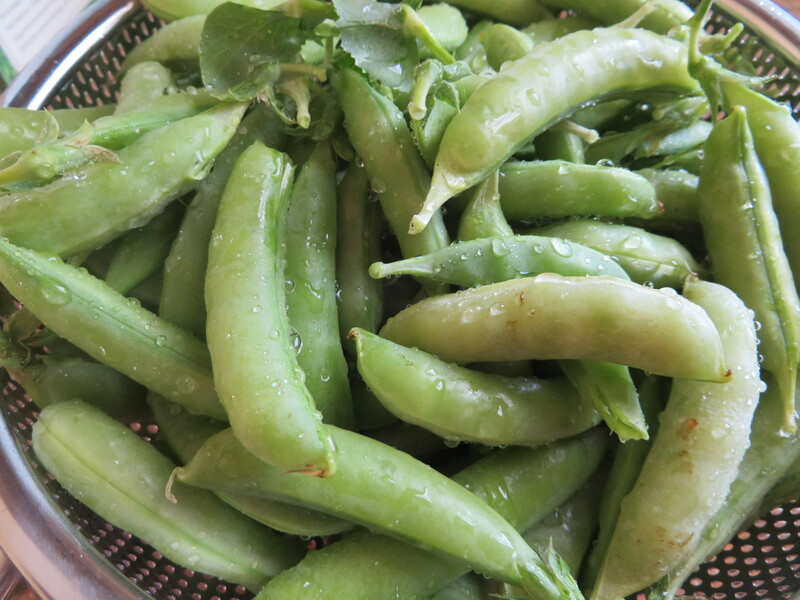 Way back when (ok, not that way back, two years ago) when I was pureeing baby food I took the freshly picked peas, shucked and steamed them, and blended them with a bit of fresh mint leaves. It was simple and divine. And different! Peas adapt well to a whole array of seasonings, so be sure to try out different ones–oregano, basil, even a pinch of ground black pepper. The sweetness of the peas, particularly when they are young and freshly picked, makes it a great vehicle for introducing new spices to your little one. Am looking forward to more summertime farm finds. And little Ela is almost four months old! That means she will be ready for solids soon. Can’t wait to introduce her to the tastes of the world. From Kirina’s highchair to your little one’s, bon appetite!